Anna’s take: 3UP Rooftop Bar is breathtaking because of its atmosphere and panoramic of downtown Carmel. The food only adds to that. The restaurant offers indoor and outdoor seating. Outside heaters will keep you warm even in winter. 3UP Rooftop Bar allowed me to try several different items, including shaved brussels ($11), short rib slammers ($15), fried oyster po’boy ($24) and Impossible Sliders ($14). My personal favorite were the Impossible Sliders, two sandwiches topped with a kale and cilantro salad, a chili lime dressing and served on a pretzel bun. The meat is plant-based and completely vegan, but it has the taste and texture of a grilled burger. I’ve had my share of vegan and vegetarian burgers, and they’ve never fully satisfied me because of the different texture. But these did. They are stacked high and are a wonderfully filling meal. If I wasn’t told the meat was vegan, I would have had no idea. The shaved Brussels is a Brussels sprouts salad dish stacked with charred Brussels leaves tossed with raisins, walnuts, candied bacon and a lemon poppyseed vinaigrette. The salad tastes like a mix of the seasons because it has wintery ingredients such as Brussels sprouts but the candied bacon and lemon poppyseed vinaigrette reminded me of summer. 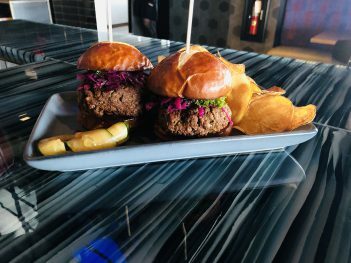 The short rib slammers are a house-braised short rib with smoked onions and queso blanco cheese sandwiched between a pretzel bun and served with a side of 3UP’s “hot chips.” The sliders are served with a house-made English sweet and spicy pickle. The fried oyster po’boy nearly beat out the Impossible Sliders as my favorite, because I am a sucker for anything oyster. 3UP Rooftop Bar takes the mess out of a po’boy by serving the dish open-faced on a bed of field greens. The oysters are dusted with a Delaware Bay seasoning and pan fried, then nestled against a peach chorizo chutney and a grilled piece of Cajun toast. All the flavors complemented each other really well. The dish could be shareable or a meal for one person. Although 3UP Rooftop Bar is on the second story above the formal and elegant Anthony’s Chophouse, the vibe is different. 3UP Rooftop Bar encourages shared plates and is an inviting place for friends to enjoy cocktails before an evening out in downtown Carmel. Suggested pairings: 3UP Rooftop Bar has an extravagant list of specialty cocktails that pair exceptionally with the dishes listed above. Pair both slammers with the Blueberry Botanical, a light, refreshing cocktail featuring gin, basil and lime juice. Pair the fried oyster po’boy with the Smoked Pineapple, a mezcal-centric drink which tastes slightly smoky due to the sweet and salty rim and the mezcal, which is sweeter, richer and smokier than tequila.